I have a couple of nice birch snags in my garden, and the one that’s close to the house (only 10 metres from the dining room window) has a nice cavity excavated last year by a pair of flickers. As soon as the cavity was finished one of the local starling pairs decided that it would make a nice nest site for themselves, and began a protracted battle with the flickers. Eventually the flickers managed to lay a clutch of eggs, but the constant harassment continued as they tried to incubate the eggs, and eventually the flickers gave up and abandoned the nest. This spring the struggle was on again. The flickers cleaned out the cavity and things looked good, but the starlings fought back and began to make a nest in the cavity with grass and feathers. The flickers fought back and one day I saw them pulling the starling nest out of the hole; in the pile of debris on the lawn lay a single flicker egg, presumably laid before the starlings took over. To our relief, the flickers prevailed and the starlings stopped all attacks on the nest. We enjoyed watching the pair switch incubation and brooding duties throughout the day and last week I noticed that the young were big enough to meet their parents at the cavity entrance. One point of interest is that the male flicker was an intergrade between the western Red-shafted Flicker and the eastern/northern Yellow-shafted Flicker, having the red mustache of the Red-shafted but also the red nape patch of the Yellow-shafted. Normally we have only pure Red-shafted nesting in southern British Columbia, while the Yellow-shafted form nests across the northern third of the province. In central BC there is a broad zone of intergradation where many birds have intermediate characters. We see these birds in the winter, but most go back to the Carib00-Chilcotin or Fraser Plateau to nest. Last week we hosted a garden party with 30 people eating dinner within a few steps of the nest, and the birds continued to feed their young. Laure Neish came by to photograph the birds a couple of days ago, and you can see some of her photos on her website. She noticed that one of the male nestlings had the same red mustache and red nape combination as its father. I expected the young to fledge in a week or so, but yesterday it all came to a premature end. Seeing some of the honeysuckle vine torn down, I went to investigate. My heart sank as I saw flicker feathers scattered through the downed honeysuckle, and a glance at the nest cavity told the rest of the story. The hole had been ripped wide open. 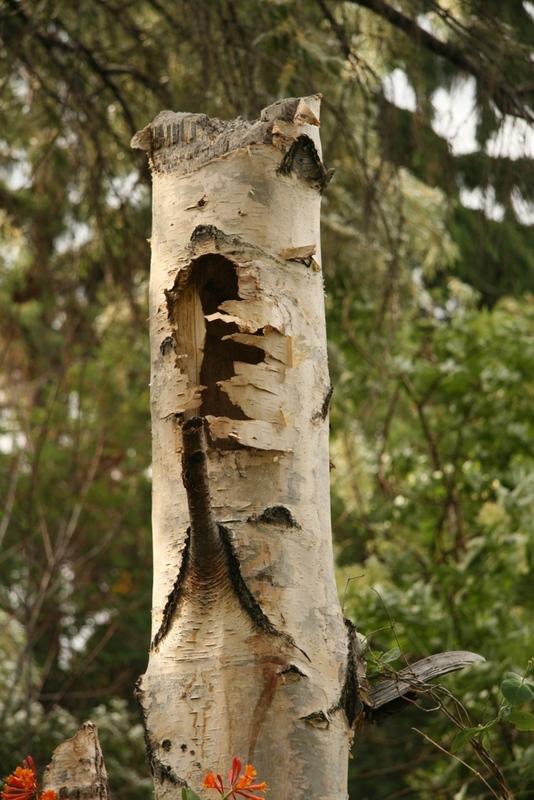 Only one animal common in my yard could or would do that, and the claw marks on the birch bark confirmed it. A black bear had climbed the trunk and opened the nest for breakfast. I know nature is red in tooth and claw, and I’m happy that bears do natural things in my yard instead of eating garbage (or my tomatoes), but it was tough to see two years of effort by that pair of flickers be wiped out so easily. 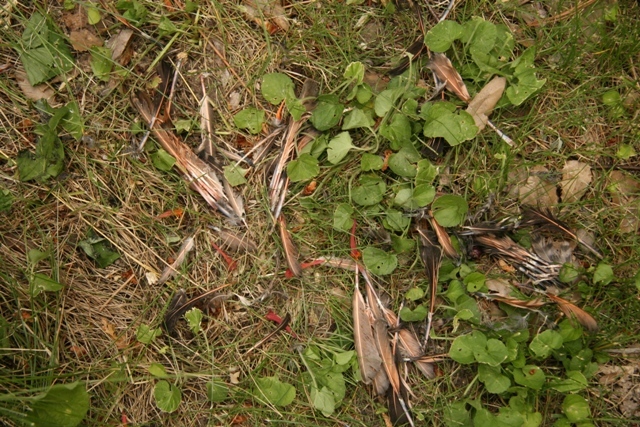 Postscript: Just now I saw one of the fledglings hopping around the garden–so it appears that some survived the attack. Have some information on a new Audubon Christmas Bird Count in the Lost Pines Region of Texas. Thought some of your blog followers might be interested as wildfires in the already sensitive environment of loblolly pines a bit west by about 100 miles of where they are naturally obviously affected bird populations and it will be interesting to see how they adjusted perhaps. We have a news release on the event we can send you but I don’t see an email or contact information on your blog.